Cyrus sails to Stros M'Kai from Wayrest on Brennan's ship. Brennan is the captain and Eli is the helmsman, though he only appears in The Origin of Cyrus! You begin the game on the deck while the ship is still in Hunding Bay, where you are attacked by two League pirates. Once they are dead, Brennan comes out from hiding in the hull and thanks you. 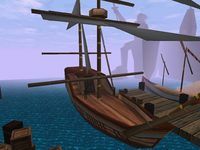 Before more pirates can attack, he has the ship sail away to Stros M'Kai's docks. The ship's hull remains locked for now. Brennan will roam the deck until you talk to him after the quest Escape the Catacombs, which will lead to him either attacking you on the deck or asking you to come down to the hull. No matter your choice, the hull will now be unlocked. Inside are two medium-level guards who attack on sight. In the hull, the steps lead down toward the stern, which is where the cabin is, behind a door. The cabin has two beds and a chest containing a pouch of 50 gold. There is also a table with two chairs and a lantern and pan on top. Also, near the chest are three crates, a barrel, and a basket. The ship's cargo is on the bow-side of the hull: nine crates, seven baskets, a stack of five sacks, and three barrels. Starting Out: Defend against a Restless League attack, meet with Tobias, and explore the town. The ship remains unnamed, though the hull area is called "ship's hull". This page was last modified on 15 August 2018, at 16:18.